This is one of my favorite books to provide to new sales team members. It's an easy read with step-by-step instructions how to build a profile and then LEVERAGE IT. While many business professionals are "on LinkedIn" or have the app loaded on their phone, I'm finding that recruiters, prospectors and sales closers aren't aware of the many features how to leverage this social media giant. I highly recommend this book (and attending a seminar hosted by author Wayne Breitbarth if you have an opportunity). 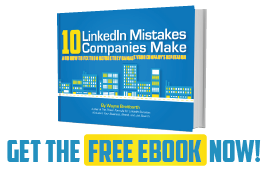 Wayne's book is the dictionary of "how to" utilize the number one networking tool, LinkedIn. I have attended one of his seminars as a participant, and recently partnered with Wayne in utilizing His services for facilitating a LinkedIn workshop. His seminars are awesome, and the book is a great hands-on referral resource to help you maximize your effective usage of LinkedIn. I highly recommend the purchase of this book to help you with your career and business connections on-line, whether it be for networking or improving contacts and sales. You will be glad you purchased this book! I am!! As the host of BizTalk Radio Show, I get presented books to preview every week. Wayne's book is one of a few that I read and implemented every chapter at the sales recruiting firm I own, Performance Group. According to LinkedIn, last year our employees' profiles ranked in the top 10% of all profiles viewed. We attribute that to Wayne's book. If you don't get your LinkedIn profile correct, the rest of it does not matter. Louis Young, Vice President, Account Executive at Frank Mayer and Associates, Inc.
"The Power Formula for LinkedIn Success" has had a big impact on my 2012 sales year. I totally overhauled my LinkedIn page so it's fully optimized and working for me. Wayne makes it very easy with simple, step-by-step, click-by-click instructions and screen shots. My company has a quota for new business development where I was charged with trying to secure at least 13 NEW face-to-face meetings with NEW prospects in 2012 at "Fortune 1000 type companies." As of August 24th, I've already had 30 NEW client meetings! Yes, 30 as of August 24th! Thanks Wayne! This is a very valuable book. I've been on LinkedIn since 2003, and it has rocketed my understanding of how to use it as a tool. I feel like I've moved from being a blind, inexperienced novice to being someone who has a lot more than a clue. This is a book worth putting the time into reading cover to cover, and we know that our time is worth a lot more than the price of the book.